Happy Fall Y’all! Oh, how I have been longing to say that for months now. 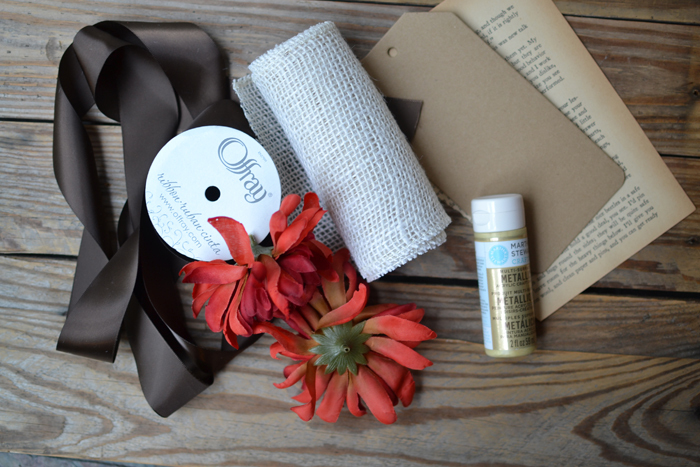 I am Kelsey from Poofy Cheeks and I am so excited to be taking part in the burlap series Maryann is hosting. 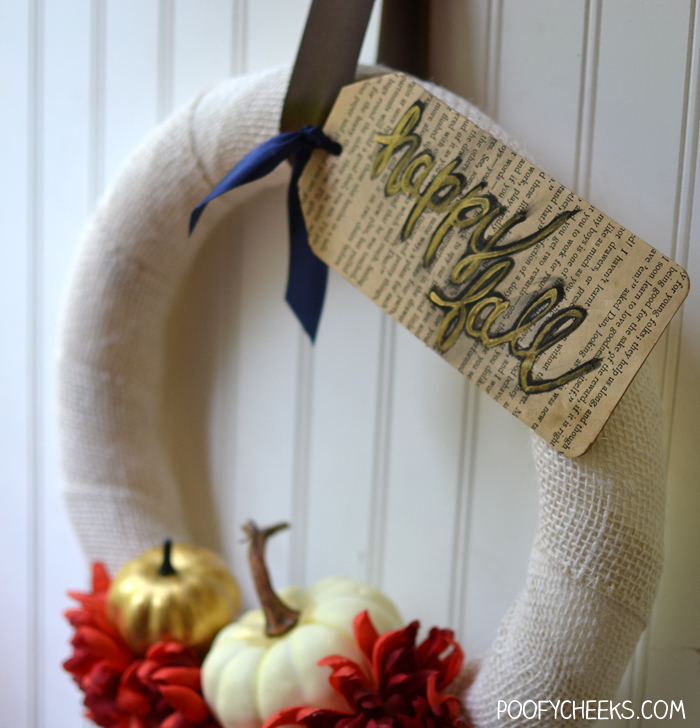 I am sharing a really simple and elegant burlap fall wreath. Believe it or not I whipped this baby up in no time and bought most of the supplies during a trip to Walmart. I live in Florida with my husband and four kids. It is still in the (GAH!) 90s here and just a few minutes outdoors has you working up a sweat, longing to go back into the air conditioned indoors. I haven’t started sipping warm lattes or baking quite yet but I hope to start soon. 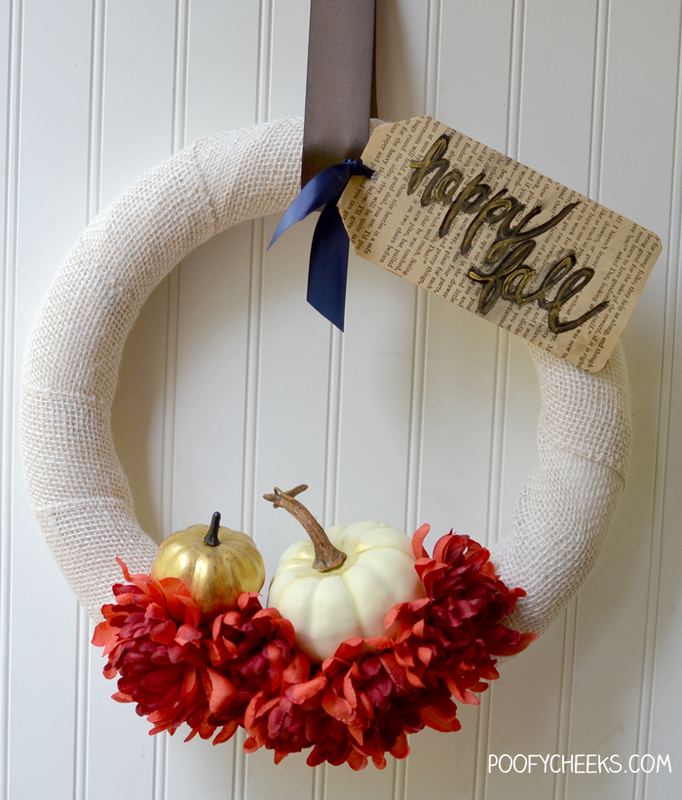 I am going to give you a quick rundown on the supplies you need and how to make your own fall wreath. Step 1: Secure the edge of the burlap to the back of the white wreath form with a few dabs of hot glue and wrap the entire wreath. 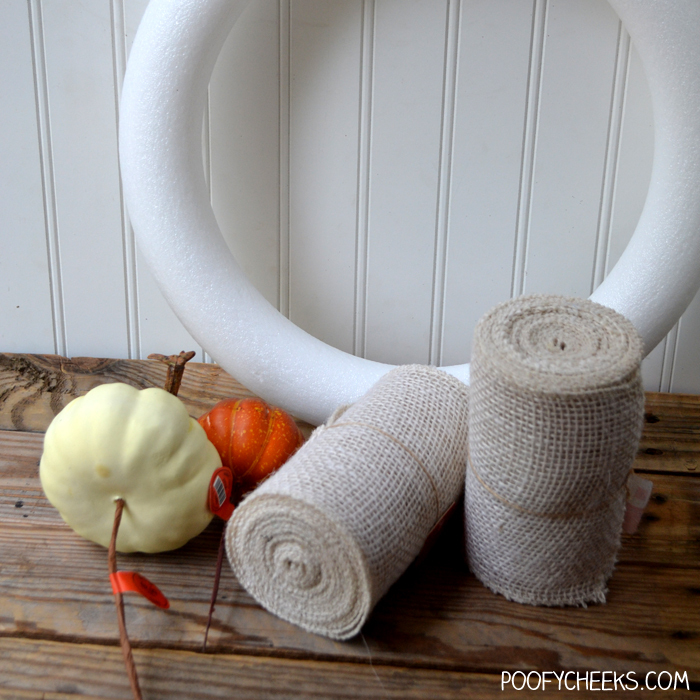 Cut the burlap and use more hot glue to secure the end to the back of the wreath. 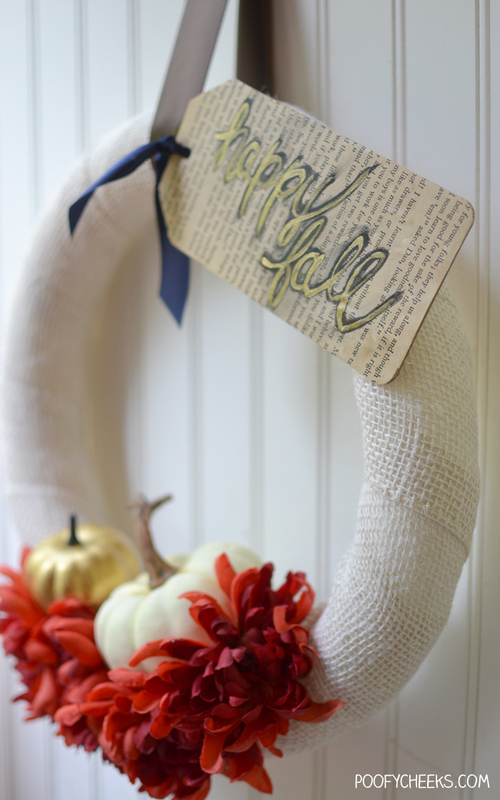 I use a white wreath form so that the green color doesn’t show through the burlap. Step 2: Use Mod Podge to decoupage an old bookpage to a chipboard shape and once dried use a craft knife to trim the edges. 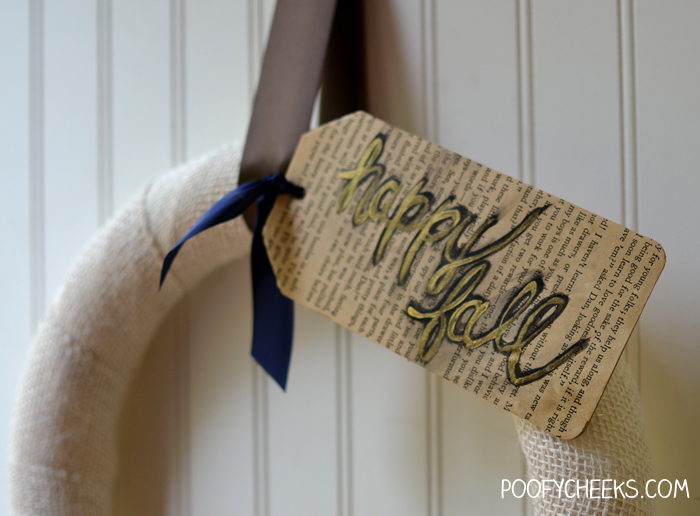 Step 3: Get out the gold paint and paint ‘Happy Fall’ onto the chipboard tag and paint one of the pumpkins. 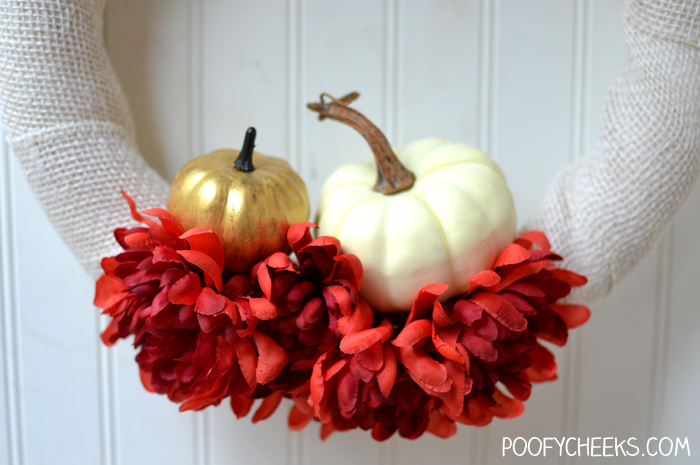 Step 4: Use a glue gun to secure the pumpkins, fake flowers and tag to the wreath form. Step 5: Tie a ribbon onto the chipboard tag and another long piece of ribbon around the wreath to hang it from. See I told you it was a simple wreath! You can change up the colors to go along with your own personal style or change the fall colors to black and orange for a Halloween wreath. I wanted to hang my wreath on the front door so I gave the chipboard tag a good coating of Mod Podge to help product it from the outdoor moisture. Now bring on the Pumpkin Spice and everything NICE! Here is something you should know about me – I am a work from home mom and I love finding things for a steal since most projects I do are on a budget. The book page I used was from a $0.05 book I picked up at a garage sale. I could give you a tour of my home and most everything would be from a garage sale, thrift store, clearance section or it was a DIY project. Most people would never know that is how we decorate our home so I take pride in each item and how we use our décor. I hope you will stop over and see me at Poofy Cheeks. I have been doing my own share of fall and Halloween crafting with tutorials (like this canning ring pumpkin and this glam gold pumpkin). I’m going to make this for my front door this weekend! I love fall decor that can stay up all season.